Violence against NHS staff is on the rise. Reported incidents rose last year by more than 1,000 nationwide (2010-11) compared to the previous year, and they rose in Pennine Care too. It’s not part of the job to suffer abuse at work, whether physical or verbal. We know violence in the workplace can often be avoided by safer working practices, proper risk assessments and good employer procedures. That’s why we’re launching a major campaign in Pennine Care to tackle the problem head on. We’re conducting an anonymous survey of all staff in Pennine Care to determine how much of a problem violence and abuse at work is, and how those who suffered such incidents were treated afterwards. It takes only a few minutes to take our survey online – please take part today and help us build a case for improving lives at work. As well as enabling staff to take the survey online, we’ll also be distributing publicity and paper-based surveys to workplaces to raise awareness and enable all staff to take part. Remember not everyone has internet access, so it’s important we get materials out there to staff so that they can be involved. If you’ve not seen any campaign materials in your workplace yet, you could play a vital role in helping us do this. It only takes a moment to order campaign materials and surveys for your workplace online, and our team are waiting to hear from you. Please click here to visit the special campaign page on our website and we’ll send some across to you straight away, free of charge. Remember, the more people who get involved and share their experiences anonymously, the greater a case we have. We’re serious about making Pennine Care workplaces safer, but we can only do this if we work together. 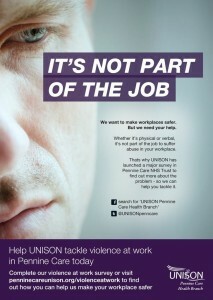 This entry was posted in News and tagged its not part of the job, pennine care nhs trust, UNISON, violence at work. Bookmark the permalink. Comments are closed, but you can leave a trackback: Trackback URL.